On my first trip to Guadalajara, Mexico, I had the amazing fortune to participate in an experience called “Dare to See.” While the program no longer exists (and is likely relocating to Mexico City), there are others around the world that encourage you to see with your soul and senses, rather than with your eyes, as a way to better communicate and appreciate. The basic concept was to figuratively open our eyes (while they were shut and blindfolded) to help us understand that we cannot take things for granted. The mechanism for achieving this awareness was dining without seeing. After being led blindfolded to a room where dinner was to be served, being seated next to guests that you could not see and, hence, could not develop any preconceptions about, you began a dinner where you could only surmise what items were on your plate and where they were, where you had to guess at the ingredients, and where conversations became somewhat challenging as you had to refocus and sharpen all your senses. For some in our group, the emotional impact was overwhelming. For others, it was a revelation. For more information, contact Liliana Aceves. www.visiontour.com.mx. 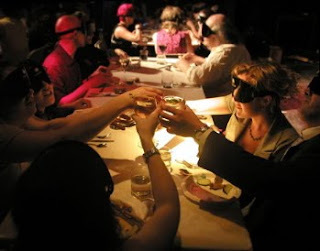 Photo courtesy of Dark Dining and Gothamist.